“This is the best year of my life” beams Doan Trang, one of Vietnam’s most charismatic popular singers of recent decades. She’s just hit one of the most universally dreaded milestones of anyone’s lifetime, clocking into her forties in early February—yet for a performer whose youthful confidence has always been the core of her stage presence, she remains blissfully unconcerned about her age. The maturity of Doan Trang’s perspective is an interesting emergence. Trang’s career has undergone profound changes in recent years—she is a highly-sought-after cultural performer in Vietnamese communities overseas, and in the past year she has performed more frequently in Europe and the US than she has here, where her work has instead focused more on her television roles as host and mentor on a number of game shows. Where these evolutions will take Trang in future remains to be seen—although one thing that can be comfortably relied upon is her persistent strength of character, which has repeatedly seen her resisting any attempts to modify her style since her first entry into the public eye. It was 2001 when the petite, darkskinned beauty from Long Khanh competed and won second place in one of the biggest singing contests in the country, Tieng Hat Truyen Hinh, a victory that guaranteed stardom at a time when such competitions were rare. She was a rebel from the start, refusing to wear the traditional ao dai for the final performance and delivering a popular ballad rather than the propaganda tunes expected of contestants. As a new public figure, she quickly recorded a few sugary tracks that became hits, but it wasn’t until she caught the attention of prominent composer and producer Quoc Bao that she discovered what would become her signature style. As Vietnam’s first performer exclusively devoted to rhythmic Latin tracks, Doan Trang quickly developed a reputation for her sensuous, energetic performance style and warm, tanned look. It was then that a close friend and music writer coined the perfect nickname that has remained synonymous with her brand ever since. Trang’s self-confidence was evident from the start. Her parents noticed her aptitude for the arts very early on, and took her to the local Youth House every summer to join the singing club, where she learned her first pieces of music. With the same group, she and the other children would watch movies, and then they would all be sent home to write their own impressions of what they had seen, competing the next day to see who could retell the story best—she would always win. Doan Trang continues her writing habit to this day; she’s sometimes called “Notebook Singer” in the media for her conspicuous habit of frequent journal-writing. By the time she entered university, she was already clearly destined to be a performer, studying at the Conservatory of Music at the same time as pursuing a back-up career in teaching at HUFLIT. 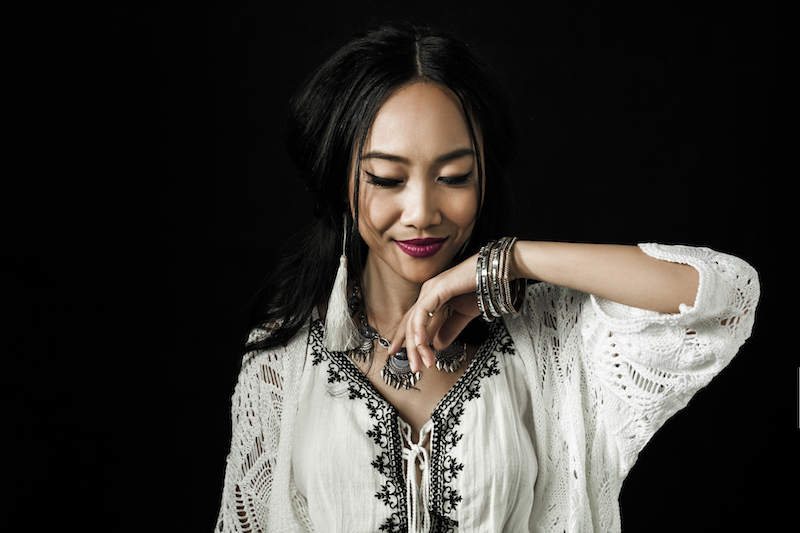 Following graduation and her highprofile competition win, Doan Trang’s career progressed in a very straight line, with a rapid succession of album releases that explored various Latin rhythms from a Vietnamese perspective. Trang’s determination to stick to her own style didn’t always play to her advantage, however—the rise in popularity of EDM in particular saw fans losing their patience for the more complex beats that typified her music. At the same time, Trang’s personal life proved tough to manage. The couple, whose daughter Angelina is now four years old, have an exceptionally close bond. “Many Vietnamese people think that after marriage, you don’t need to feed your love anymore,” she says, “because anyway, you’re already husband and wife. But my husband said no, it’s like a tree, you have to take care of it every day—and then he did that. He taught me so many things about love and married life, and everyday we’re in harmony.” The pair had the chance to portray their relationship onscreen in Minh Thang Ly’s 2016 film Saigon Anh Yeu Em, in which they played characters very much like themselves— while Johan had zero intentions to pursue his own acting career, Trang managed to convince him that if he didn’t take the role of her husband in the movie, another man would. He gave that prospect a little thought and then replied, “OK, I’m in.” The film was well received in Vietnam and Australia, and is now publicly available on YouTube. While Trang’s current work in Vietnam now firmly revolves around her television projects (she describes herself as being unusually devoted to her mentor roles, to the point where the directors have asked her to take things down a notch) there’s another album in the works for this year. It’s been a while since her last release (The Unmake-up, an English-language album recorded in Germany) faced a discouraging reception that has led Trang to wonder about her decision to doggedly pursue herown style rather than cater to the brief attention spans of modern local music consumers. given some encouragement to young Vietnamese women who may themselves have faced pressure to change their style, skin color, or the way they look.